WIND. 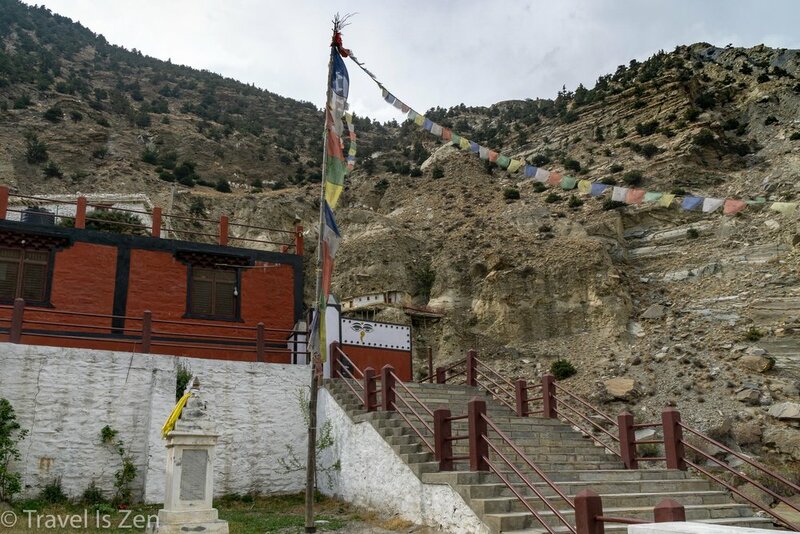 Kagbeni sits where the Himalayan foreland in the south meets the high Tibetan plateau. 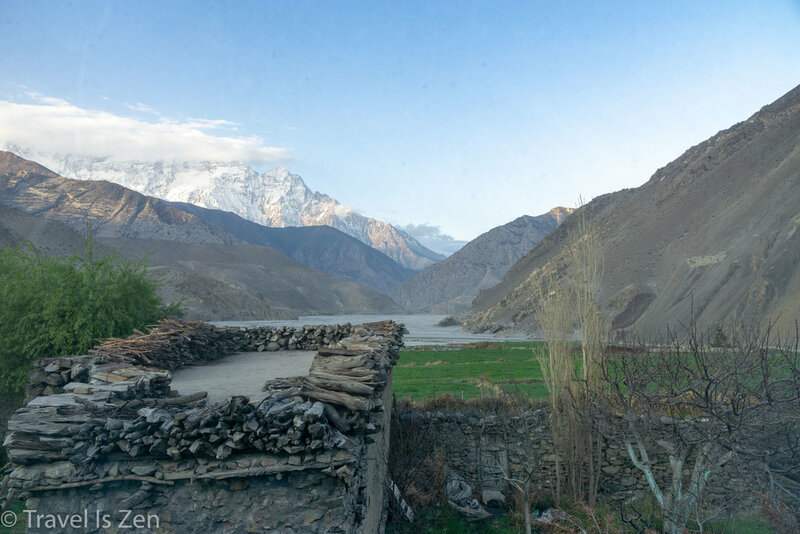 A large exchange of cold air from the north and warm air from the south occurs daily, roaring up the Kali Gandaki -- the deepest river valley on earth -- as a fierce recurring wind tunnel. 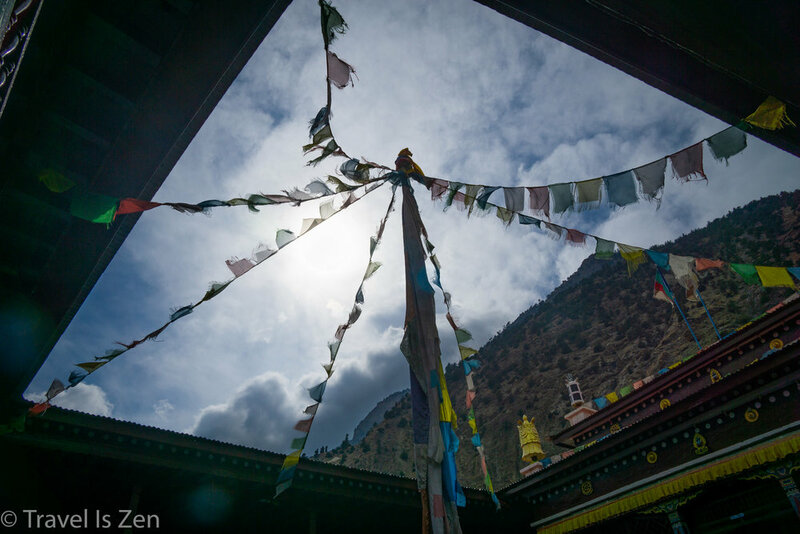 The wind starts downstream, just north of Marpha. 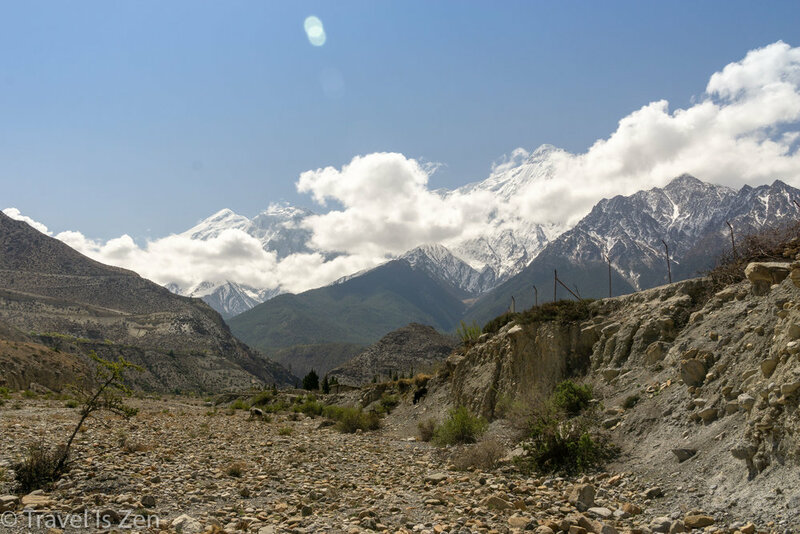 The river valley, flanked by Annapurna and Dhaulagiri mountains, narrows and concentrates the airflow. The wind hits Kagbeni at high velocity by 10:00 a.m. We were warned that we would be walking in a headwind most of the day today, since we were headed south to Marpha. We headed out early to get as far as possible before the wind. 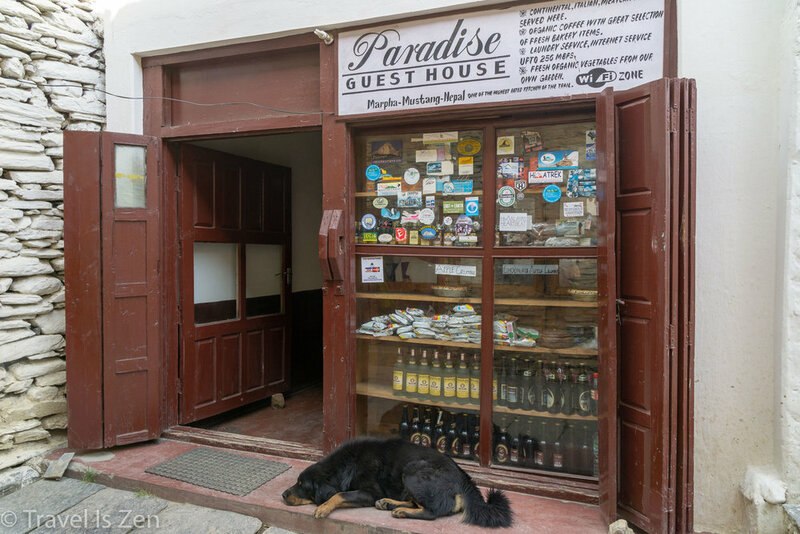 We made fast progress, since we walked along the flat riverbed all the way to Jomsom. 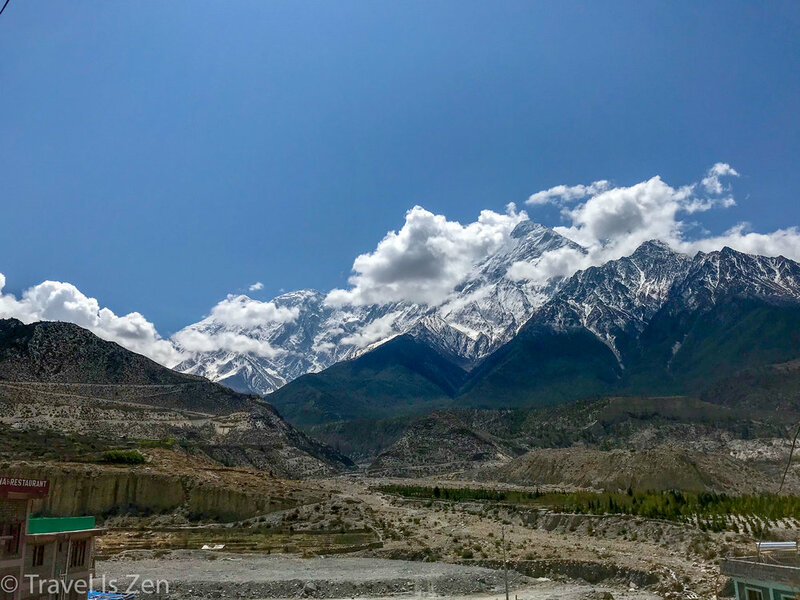 This is the area where the Indian continent presses into the Eurasian continent; tectonic movements continue to uplift the Himalayas a few millimeters every year. 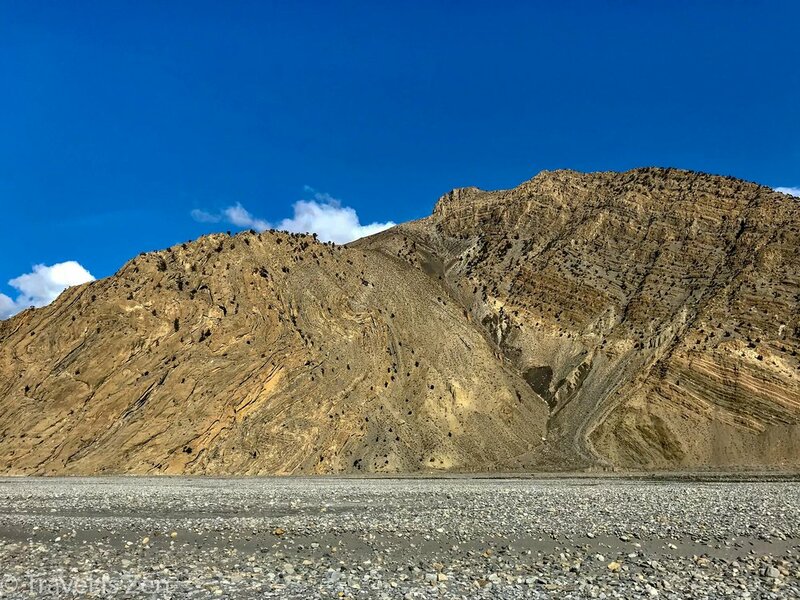 Millions of years of geology are visible in the landscape, from the variety of sedimentary and metamorphic rocks deposited in the riverbed to the compression and folding seen in the valley walls. On my bucket list: return for a guided tour led by an expert geologist. 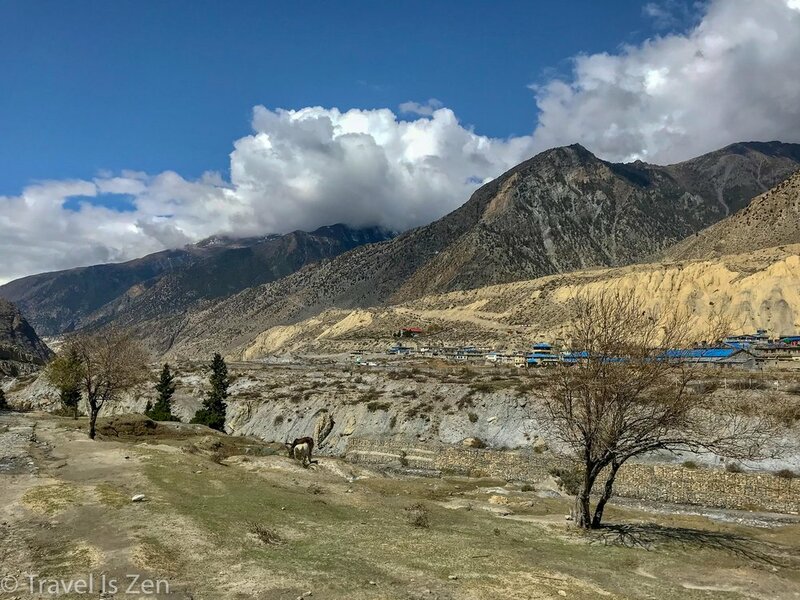 We joined the official Annapurna Circuit NATT trail in Old Jomsom, on the east side of the river, and watched the planes landing at the airstrip on the opposite side. 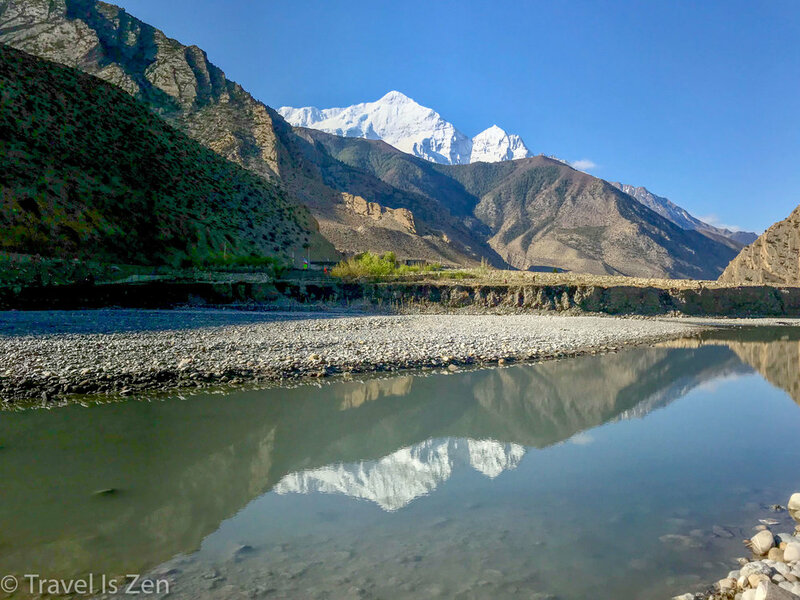 Although the Kali Gandaki looks like a stream because the river bed is so wide, when you get up close, it's actually deep, fast moving, and too wide to cross without getting wet. 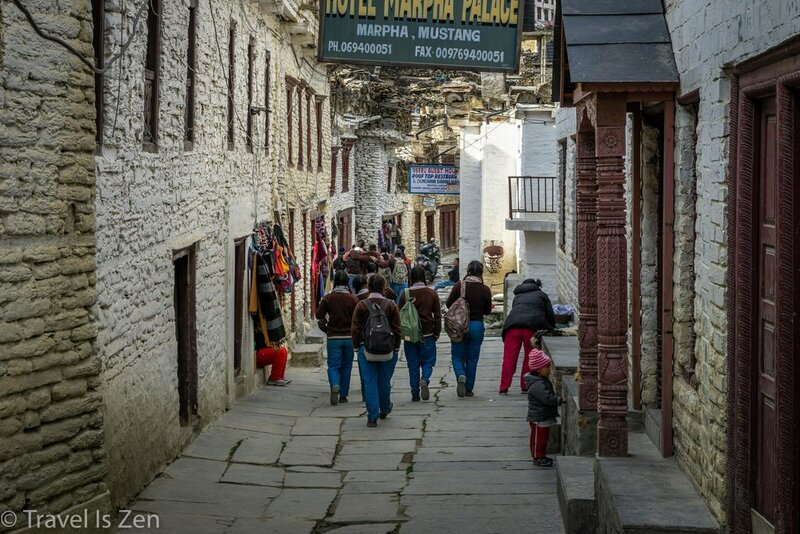 Marpha lies on the west side of the river, so we knew we'd have to cross eventually. By the time we crossed the river, the wind had reached peak speed and strength. 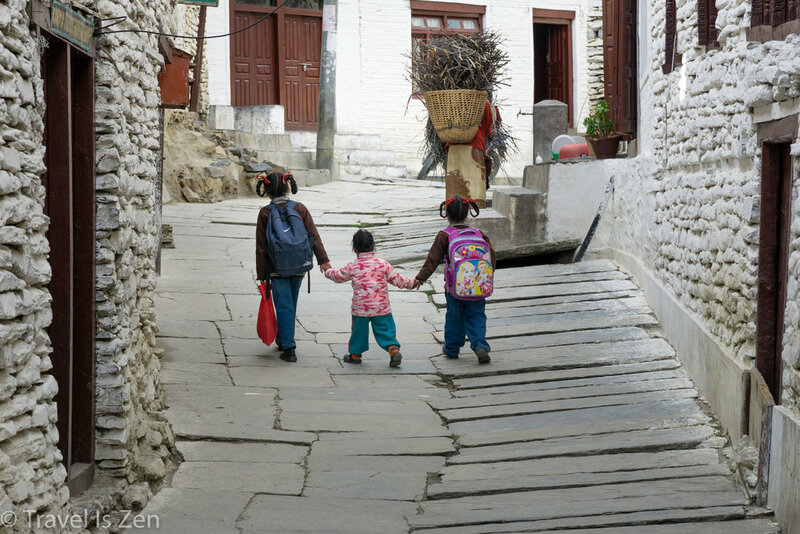 It was tough walking, especially with dust particles pelting our faces. We pulled our handkerchiefs up under our sunglass. At one point, my hat blew off and I had to chase after it, with my 20 pound backpack bouncing. I would not describe this section of the trail as "enjoyable", but it was an experience! 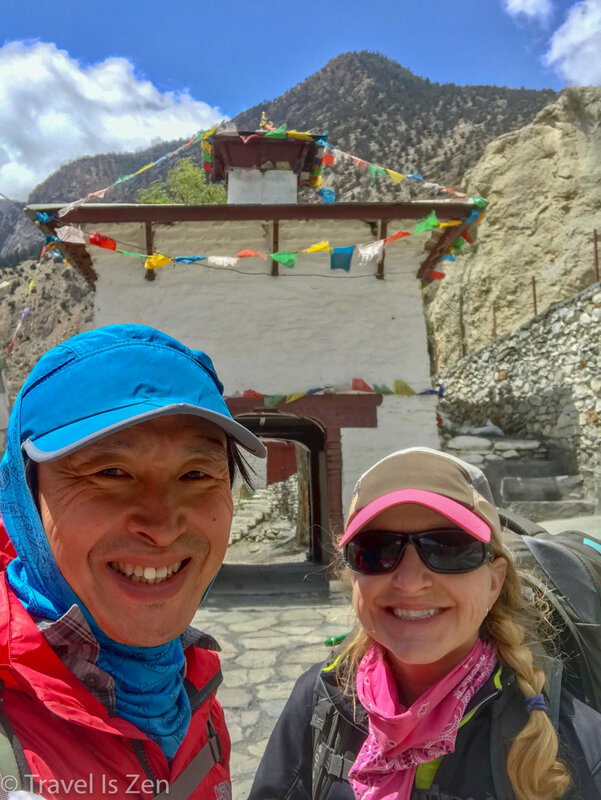 We were all smiles when we reached the gate of Marpha. Almost immediately, we were out of the wind. It was calm and quiet. 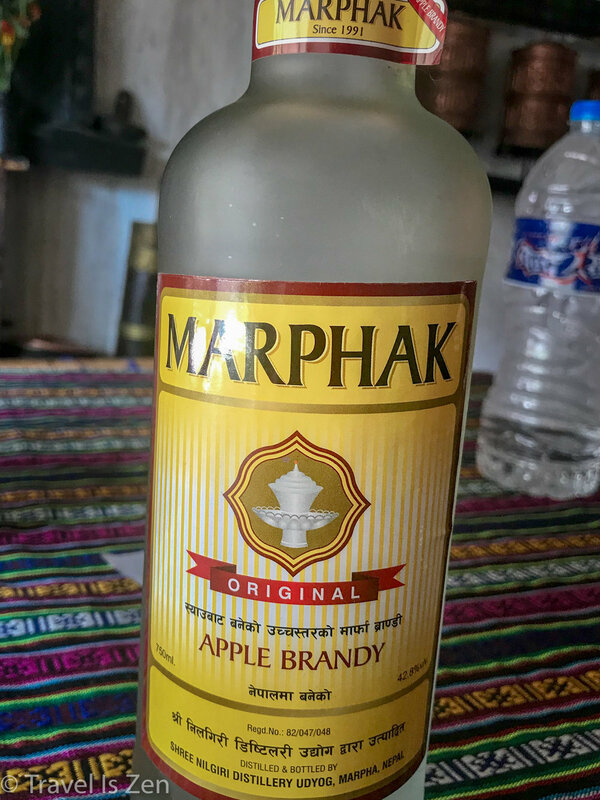 And sunny - good time for a solar-powered hot shower, lunch, and some famous Marpha apple brandy! 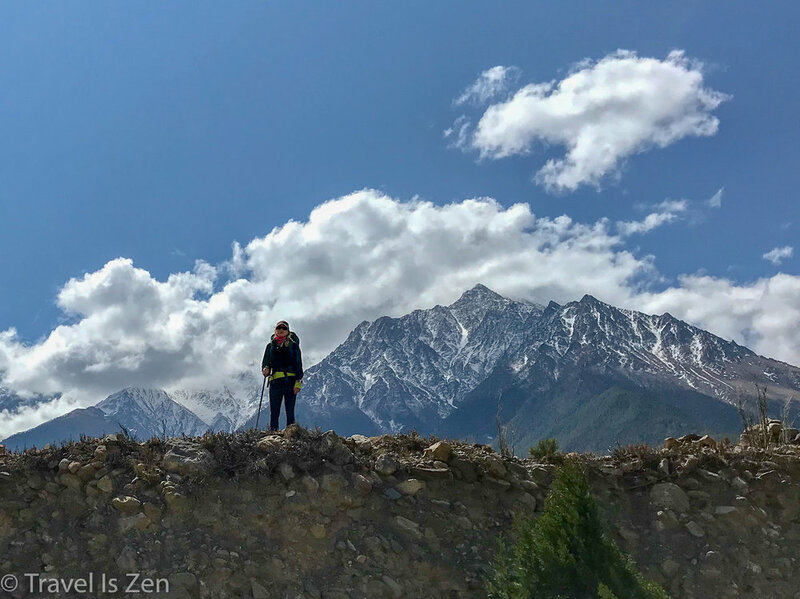 Marpha -- sanctuary from the wind -- is a beautiful town, with white-washed walls, granite-lined streets, and apple tree fields. Caffrey spent some time after lunch exploring the monastery and zen meditation center. I rested in bed with a nasty cough and sinus infection.